Keep the kids active during the Summer School Holidays in and around Melbourne. As parents ourselves we understand the joys (and challenges) of school holidays. For working parents, this can be a real juggling act. Fortunately, there are so many amazing options for School Holiday Care, School Holiday Classes and School Holiday Camps available. The School Holidays are a great time to try a new activity, learn new skills in an activity that they already love, get out and about, catch up with friends and visit somewhere new in and around Melbourne. Our online directory is the perfect tool to search for fun and family friendly school holiday classes, activities and fun days out in your area. Enjoy a family day out at Event Cinemas to see one of their latest movie releases. See all the trailers for the latest release movies here including; The Grinch, Disney’s The Nutcracker and the Four Realms, Mary Poppins Returns, How to Train Your Dragon – The Hidden World, Storm Boy, Ralph Breaks the Internet, The Kid Who Would Be King, Instant Family and more! Enjoy seeing a live stage show, musical, concert or a trip to the ballet with the kids. This is such a great opportunity for kids to experience the joys of music, dance and the arts first hand. Steve Backshall is back by popular demand with his Deadly 60 Downunder Tour this January! Star of the hit TV series Deadly 60, Steve Backshall is returning to Australia. Don’t miss DEADLY 60 DOWN UNDER back by popular demand to Australia these summer school holidays. 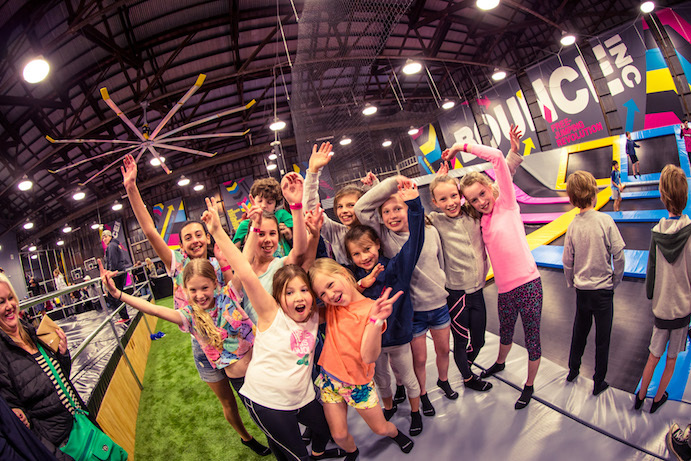 Unleash your Ninja at BOUNCEinc Essendon or BOUNCEinc Glen Iris and BOUNCEinc Blackburn North‘s X-Park adventure challenge course is the ultimate Freestyle Playground. Take on ‘Ninja Warrior’ obstacles like the Warped Wall, Spider Climb and Wedge run. Race your mates, race the clock, or just have fun and improve your skills by mastering individual elements of the course. Become a Palaeontologist for the day, kids can gig for fossils, enjoy arts and crafts and will be amazed to see the greatest creatures ever to walk the earth return and come alive before their very eyes. Jurassic Creatures, is an interactive walk through event that will captivate young and old alike. Explore an ancient world full of animatronic dinosaurs. Plan a day out to the Melbourne Planetarium. A visit to the Planetarium is lots of fun and a great way for kids to learn about the Universe. State Library Victoria offer a range of free and low cost kids school holiday activities which are sure to keep the kids busy. Activities include; coding, technology, maker spacers, story time, arts and crafts, author visits and more. Be sure to book early as the programs are really popular. Let the kids have some fun at one of the most exciting and colourful destinations in Melbourne the Queen Victoria Market, with a range of FREE activities for kids to enjoy in a secure and safe environment. Get on board the journey as Puffing Billy takes you through the magnificent Dandenong Ranges, located only one hour east of Melbourne. With lush fern gullies brushing past and Mountain Ash trees towering overhead, Puffing Billy makes for a wonderful opportunity to relax and breathe in the fresh air whilst the train makes its way through the temperate rainforest. The kids will love the experience of seeing some of their favourite marine life up close on one of Wildlife Coast Cruises unique cruises. Do you have a budding little Master Chef? Kids will love cooking up a storm in one of Whipped Up’s Holiday Cooking Classes. This content is supported by Play-Doh. Play-Doh is a great school holiday activity for children, especially preschoolers. You can read about how you can develop your little ones fine motor skills with Play-Doh here and can buy Play-Doh at great prizes from Amazon Australia here.